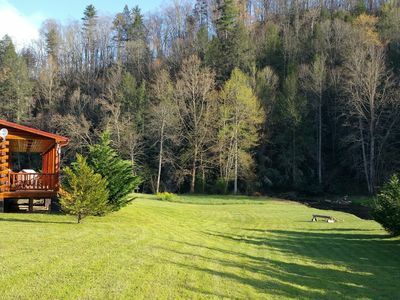 The ‘Chestnut Log Cabin' is the perfect 2-bedroom, 1-bathroom vacation rental cabin handcrafted from the rare Chestnut logs of yesteryear. 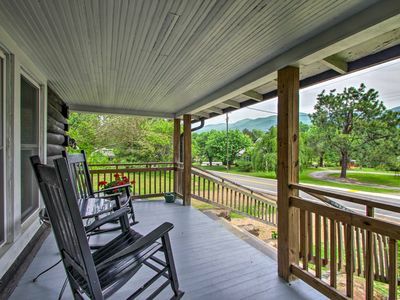 The interior is beautifully resorted to its original 1922 Arts and Crafts style, creating an inviting, soothing, mountain getaway for 7. 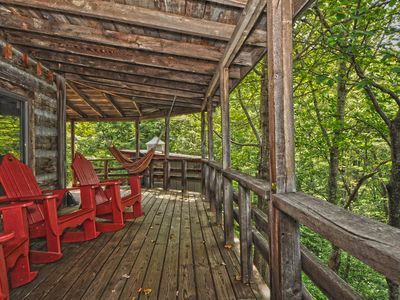 Boasting a private outdoor hot tub, relaxing fire pit, lush garden, and large covered porch lined with rocking chairs, this cabin embodies the perfect getaway in Hot Springs along the Appalachian Trail! 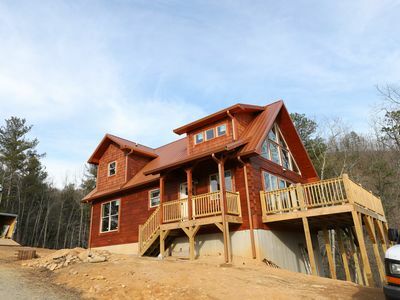 Choose 'Chestnut Log Cabin' for your ultimate romantic getaway or family mountain retreat. 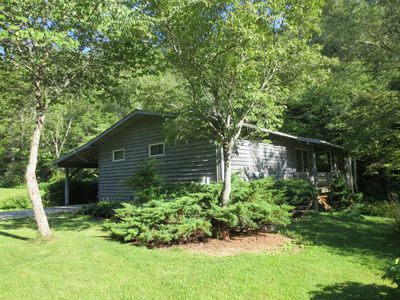 Once you experience the magic of this property, you will claim 'Chestnut Log Cabin' as your new home-away-from-home! 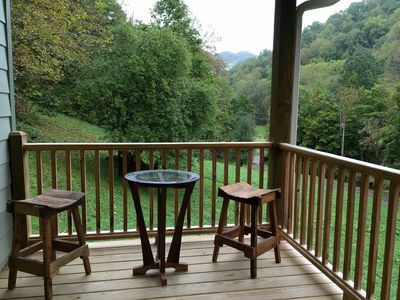 The interior is beautifully restored which creates an inviting and soothing mountain getaway. 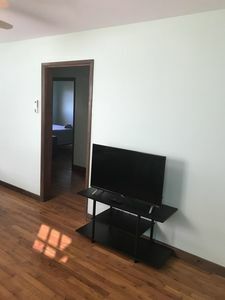 Follow the original hardwood floors into the living room featuring a flat-screen satellite TV, DVD player and secured internet. A fully equipped eat-in kitchen pairs the original cabinets and sink with modern appliances. 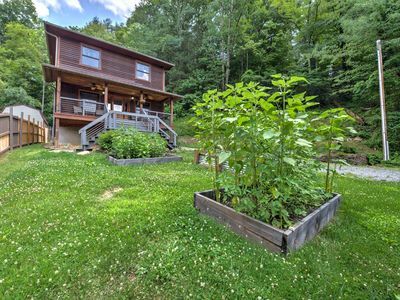 Prepare home-cooked feasts to enjoy at the dining room table or out on the furnished patio surrounded by lush terrain. 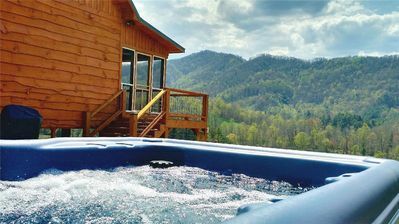 You won't have to leave the property to experience your own take on modified hot springs - relax with a long soak in the hot tub for a carefree evening. Others can gather together around the fire pit for storytelling and s'more roasting. 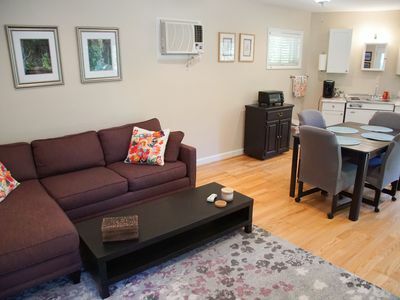 Both bedrooms and futons are eager to deliver a restful night's sleep for 7 tired travelers. 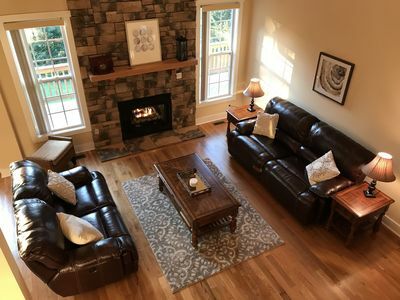 Wake up to sip your morning coffee in the bright & cheerful sunroom! 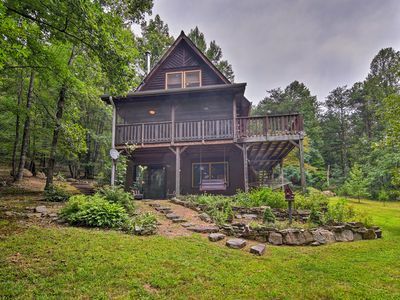 'Chestnut Log Cabin' is nestled at the edge of Hot Springs simply a 10-minute stroll into town. Leisurely walk to grab a bite at Smoky Mountain Diner before stopping in the Welcome Center. 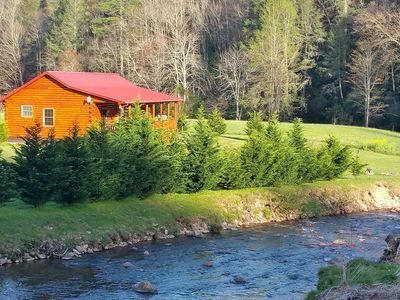 Enjoy a spa day at the Hot Springs resort while anglers fish in the French Broad River for trout and bass. Hikers will be able to access trailheads within minutes that yield panoramic mountain views. 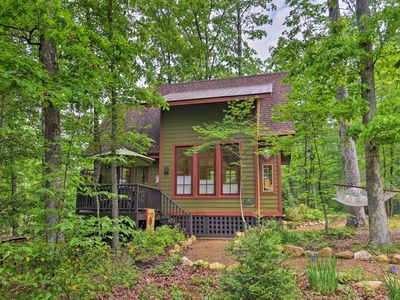 If you are in town for a festival, wedding celebration or spa weekend, this is the cabin for you! Keep your car parked at your cabin and walk to your event, or stroll home after a romantic dinner. 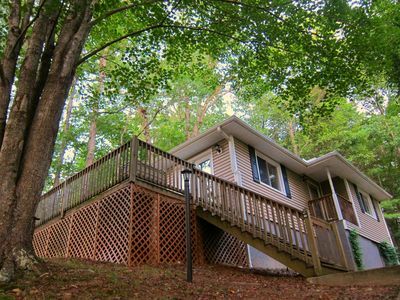 Plan a day trip to Asheville located 50 minutes away from this cabin. Be sure to pay a visit to the Biltmore Estate & Winery - one of the more extraordinary places to visit that showcases an azalea garden, museum, and impressive chateau architecture. 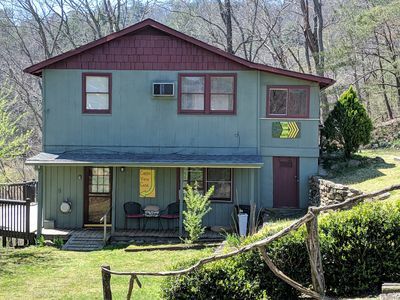 - Fantastic Hot Springs location - Within walking distance to shops, restaurants, festival sites, swimming holes along the French Broad River, easy access to horseback riding, canoeing, kayaking, and other outdoor recreation! 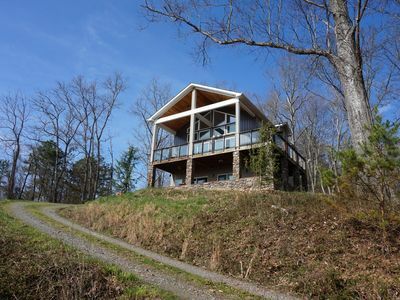 Luxury Riverfront Honeymoon Log Cabin! Privacy! Camp Fires! More! 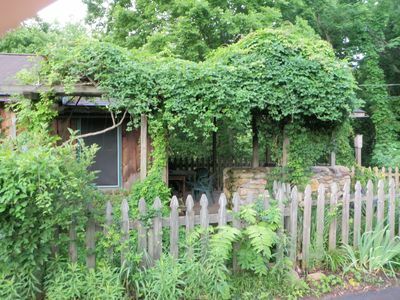 Near Downtown And On Appalachian Trail. WIFI. 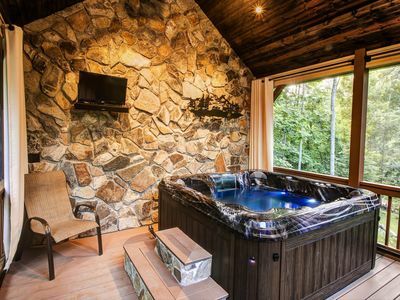 Romantic Getaway With Jetted Tub! 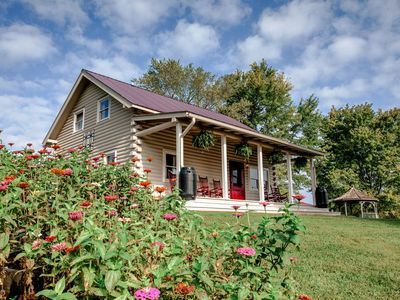 French Broad Cabin: private hiking, covered porch, fire-pit, downtown Marshall & 70 Mile VIEWS! 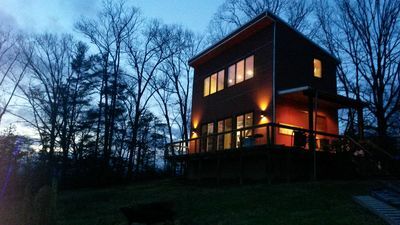 New Cabin on Working Farm, Hot Tub Fed by a Spring, Views, Cows, and a Donkey! Custom cottage with beautiful touches! Near the artists' haven of Marshall! Includes Biltmore!